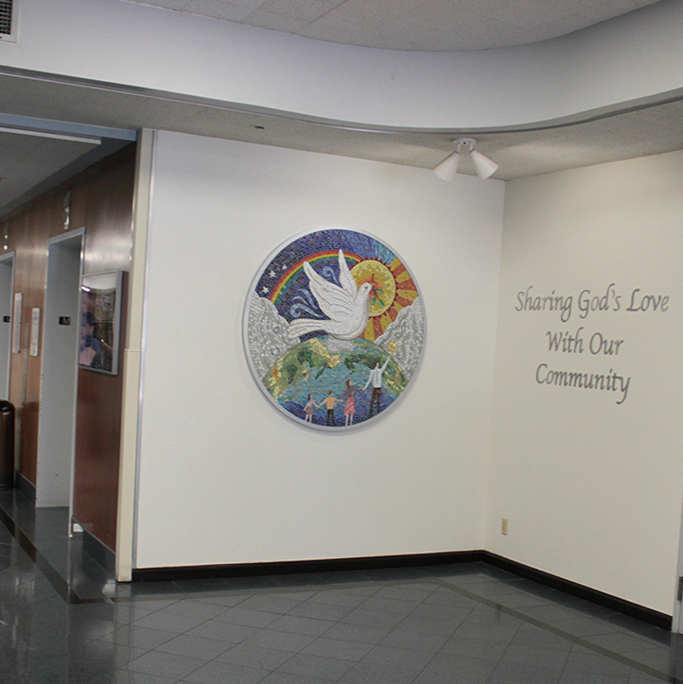 A colorful mosaic at St.Joseph Mercy Oakland by Jacqui Ridley and Morrine Maltzman. Annette Ridenour is the president of Aesthetics Inc., an art consultancy firm specializing in the creation of art programs for hospitals. Her bio from the Aesthetics website describes her as “a pioneer in applying the arts to improve health and healthcare. She served as one of the original board members of the Society for the Arts in Healthcare, and she co-founded the Blair L. Sadler International Healing Arts Competition, which recognized exemplary arts projects that have measurably improved the quality of healthcare. Numerous articles by her, about her, and about Aesthetics have appeared in publications that include Healthcare Design, Health Facilities Management, Healthcare Building Ideas, and Spirituality & Health. 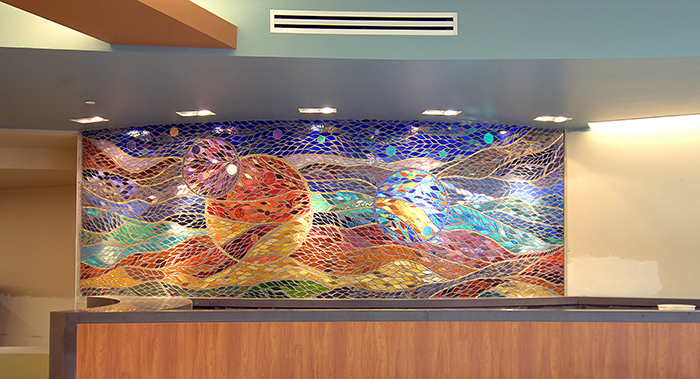 Christie Beniston‘s mosaic at Glendale Adventist Medical Center. As you can no doubt discern from the name of this blogsite, Art That Supports the Healing Process, I have a keen interest in the subject. 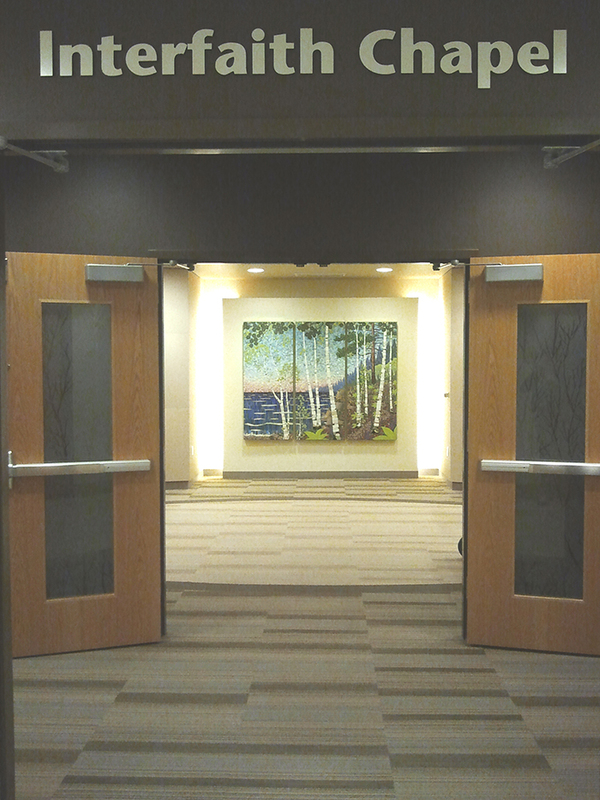 Back in 2008, I set an intention to create artwork for medical and healing environments that would have a beneficial effect on patients, family members and staff. I had no preconceived notion of how to do this. How could a painting possibly support the healing process? I read the early findings by Evidence Based Design researchers that nature themed artwork had the greatest benefit for hospital patients. And so, I began The Infinite Qualities series of mandalas based on flowers and trees. I set a second intention that each mandala both contain and convey the vibratory signature of its theme, whether that of Infinite Compassion, Vitality, Hope, Health or Life, among others. I make that happen by holding the vibration myself throughout the creative process. That’s the Quantum Theory part. The Neuroplasticity part involves accompanying guided transformational practices designed to help the viewer entrain with the vibration imbedded in the image. Repeated practice results in the formation of new neural pathways in the brain; it becomes easier and easier to bring oneself in resonance with the Infinite Quality expressed by the mandala. “INFINITE HEALTH” Digital Print from a 24″ x 24″ gouache original. One of the Award of Excellence winners in Manhattan Arts International’s “Celebrate the Healing Power of Art” 2013. Wow! A seasoned and highly acclaimed art consultant was speaking my language of Quantum Theory and Neuroplasticity! I had so many questions for this woman regarding the power of a healing intention in visual art. Personally, I feel it is absolutely key and it is the first thing I establish before starting any project. Why? Because everything emerges naturally and intuitively, based on the stated intention. Michael Sweere‘s artwork in the interfaith chapel at Children’s Hospitals and Clinics of Minnesota. P.C.Turczyn: Could you expand on the differences between artwork created with a healing intention for viewers, work intended to be healing for the artist and work done without any healing intentions? Annette Ridenour: Many artists are creating works of art to work out personal issues or reflect on personal experiences and the actual act of creating the artwork can take them through a process that creates some kind of emotional, intellectual or psychological healing for them. For example, a lot of figurative artists have done self-portraiture working out imagery of themselves at different periods, sometimes through an illness. The process can be healing for the artist. Sometimes, they feel so inspired, they feel, “My goodness, this is so healing, it can be healing for other people!” That, in itself, is not accurate because it is very, very personal. Then there is artwork where artists are exploring subjects in a series. For instance, I know of an artist who did a whole series of artwork on patterning…and it is lovely. She thought it would be, perhaps, healing to other people. But in essence, if it’s a series that they’re working out for design, composition or personal reflection, it doesn’t mean it necessarily is going to be healing for other people. The artwork I believe can be healing for other people reflects on the beauty and grace of nature, because nature in itself is very healing. It reflects perfect balance and harmony in many cases. But there are situations, like storms or sunsets, that can evoke some very negative and hard emotions. Not all artwork of nature is healing. To some people, winter, when it’s all white and the trees are barren, can be evocative of death, finality or despair. Robert Ulrich did a lot of research on this and has written quite a bit about the type of imagery in nature that does not produce positive responses to a lot of patients and their family. When I talk about intentional art, I talk about artwork where the artist, either coming from a really strong point of intuition or of knowledge, puts a very strong intention on the artwork being healing for those who are experiencing it. I believe that when this intention is so strongly focused, it has power. Over 90% of the things I work on are commissions, and I believe there is a very strong value in commissioned artwork because it can take the artist to a place where he can have a real empathy for what a patient is experiencing in a hospital. He can go through his own periods of disorientation and feeling very vulnerable. He can understand that, because it’s a personal experience that everyone has at a certain point. From there, the artist can look at their craft or art and create with the intention of positive experiences for the viewers. It’s very interesting talking with artists who work on these commissions, and then experiencing this artwork. The art does have an energy about it that is transmitted into the space and to all those who experience it. PCT: What is the mechanism of the healing effect? A.R. : I think it has to do with a positive thought. When you are a family member or a patient and are in a spiral of continual negative thoughts, you are recreating a chemistry that supports negative emotions. You have to break the emotion in order to change the chemistry to support healing. When you are experiencing a piece of artwork that makes you smile, makes you laugh, that brings you back to a positive memory, it can bring you to a place of hope. It can start changing this continuous cycle supportive of negativity. It can literally break that, allowing people to start thinking differently and feeling differently. It’s a combination of thinking and feeling that changes the chemistry and allows healing to take place. PCT: Other than intentionality, what are the qualities that empower an artwork to support the healing process? A.R. : I want to be really clear that artwork does not have to be about nature even though there’s a lot of evidence that specific types of nature imagery evoke healing. There’s a lot of other artwork that does that equally well: anything that sparks our imagination in a positive way or that is incredibly well crafted so that you look in amazement and delight. Some artwork that is interactive can allow us to go deeper and be more experiential, which can be a positive distraction, and can be healing. Elizabeth Devereaux‘s work installed in the sacred space at Santa Barbara Cottage Hospital. PCT: What did you mean by “resonance” in the quote from the teleseminar? A.R. : Everything has a vibrational energy. Quantum Physics teaches us that there are particles and within the particles are waves of energy, so everything that exists has a vibration and resonance. Each of us as human beings has a perfect resonance of health, a vibration that we are most healthy at. 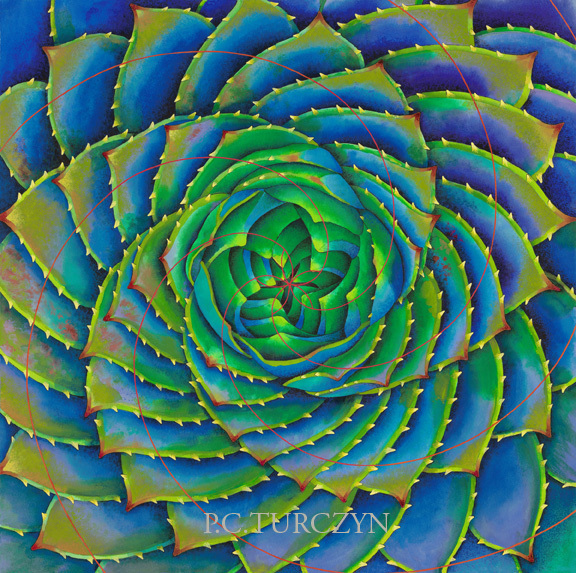 Original artwork created by an artist has a resonance, has a vibration. Thinking about great artworks throughout history, you feel an energy, a resonance that comes from those pieces. You can breath it in. There are spaces that have that: cathedrals and chapels, being in nature, and so can works of art. PCT: I would like to learn more about the field of artists working to create healing in others. Did they come to this form of art practice on their own, or did they develop it collaboration with you? A.R. : There are many artists who have come to this practice by themselves and seek out institutions and art consultants, like myself, to work with. I’m very proud to have changed the lives of many artists who are very talented and were searching for a deeper meaning in their artwork and, with guidance and opportunity, have made this their life’s work. And it’s challenging! I look forward to a time, as there has been in the past, when the healing artists will be called forth to be part of the healing process. You could think of the Shaman as a healing artist. PCT: What vision are you holding for the future of art in medical and healing environments? A.R. : I hold the vision that the entire space is a form of art where architecture and design and art are highly integrated together. I envision that the artist is highly regarded as an important and required part of the team creating the healing space. And, as you and I both know, healing spaces include homes and communities and are not just relegated to hospitals. Art that heals being seen in places that too often forget that life is richest when science and art meet in service. Thank you, Pamela T.
Thank-you for your comment, Laura. I am always dazzled by people and organizations that place equal emphasis on right and left hemispheres of the brain, or science and art. Here’s another great blog about healing art.